It’s a popular notion that the hair is a person’s crowning glory. If you spot someone in a crowd that may not be considered pretty by normal standards, a great hair cut and lustrous tresses can almost always sway a judgment. Gorgeous hair is a priceless asset, and the dozens of hair salons in every city are a testament to this. Keeping your horse’s mane and tail beautiful is one of the most important steps in having a gorgeous horse. The difference between a beautiful mane and tail and a scraggly, thin mane and tail can make as much difference in a horse’s beauty as a person’s attractiveness. The first step is to untangle the mess that often happens over winter. Start by untangling the hair and getting out all the dreadlocks. Don’t rush this process, as you don’t want to pull the hair out. 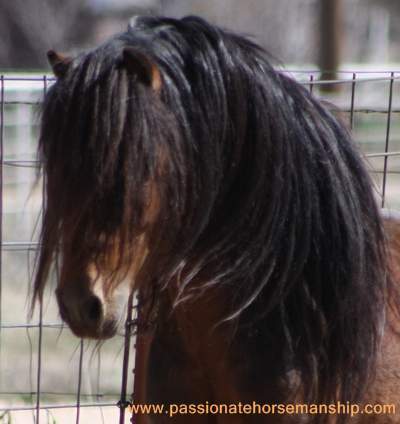 Work your way through the matted mane and forelock first. Start at one end of the mane and work your way slowly down the mane untangling one section at a time. Saturate sections of the hair with any over the counter detangler. Choose a large tangle, and slowly apply the product and separate the tangles with your fingers. Start at the bottom of the tangle and work your way up to the roots. Work the product into the hair by using your fingers, and gently pull the hairs, a few strands at a time. Keep doing this until the knots and tangles get smaller and then are gone. Repeat the same process with the tail once you have the mane and forelock untangled. You should stand to one side while detangling their tails, so you avoid being kicked by the horse. Help them maintain a calm and relaxed attitude by patting them gently, and then slowly move your hands down their necks and sides until you get to the tail. Once their hair is free from tangles, it is now safe to brush their hair by using a stiff bristle hair brush. Never use a comb, which does nothing but pull hair out. Start brushing the bottom of the hair and then work your way up to the roots. Don’t use too much force, and make sure that you don’t stretch the hair while brushing. Try to brush as gently and slowly as you can. Patience is the key to leaving the most amount of mane and tail possible. It takes a long time to grow, so you don’t want to pull out what you have already grown by rushing this important step. Beth Moore has been a leading authority on horse grooming and especially on growing long, thick manes and tails on horses for over 20 years. You can learn about her rapid growth methods and claim a free report on the benefits of owning gorgeous horses at Click Here!.